Nick Chen, provides the idea of live leader board. Change for Version 1.1Add the Live Leader-board functionality . 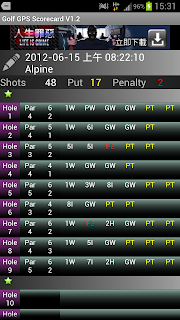 Players can see the live Leader-Board in the same round. FromVersion 1.2.1, almost every screen provide "Share Facebook" menu item to snapshot current screen as .png file and publish on Facebook wall directly, if you have Facebook account. After press the "Share Facebook" menu item, the app first snapshots current screen as .png file and saves it onto phone as current "Snapshot" function. Then it will pop up a Facebook authorize dialog, if you never use "Share Facebook" before. Enter your Facebookaccount and password to log into Facebook. From Version 1.2.2, we change to use Facebook SSO login, the authorize screen may not be same as the current screen shot. 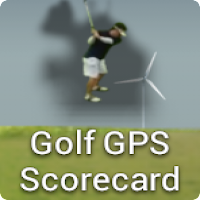 Press the "Install" button to install the Facebook app "Golf GPS Scorecard". And allow the "Post on your behalf" permission. My-STATS-ScreenThere are 2 ways to go to My-STATS-Screen First, from My-Scorecard-Screen, press the "STATS" option menu item, it will show the STATS for that game. Second, fromMain-Screen, press the "STATS" item then it will show you the most recent 3 games STATS. Setting for what's in my bag, ONLY the club checked (setting) here will be shown in the My-Shot-Screen forpick up.So far, I have not checked if the total club counts were more than 14.Once completed the setting, click the android BACK button, the app will save it and go back to Current-Map-View-Screen. Game-List-ScreenOn Main-Screen, press the "History" item will go to Game-List-Screen, whichlists all the games ever created. Date button : Sorting games by date.Course button: Sorting games by course name.Score button: Sorting games by score.Game item: Long click on the game item will delete the game.Click the game item will go to the My-Scorecard-Screen. Historical-Map-View-ScreenOn My-Scorecard-Screen, click on every list-view itemwill transfer to Historical-Map-View-Screen. Click on theSTAR sign will display the picture taken when you record the shot in My-Shot-Screen. From Version 1.2.1, Historical-Map-View-Screen provides the "animate" function. Press the button on the bottom right corner, will "animate" to the next shot position and place it in the center of the screen. There are 2 ways to go to My-Scorecard-Screen Under Current-Map-View-Screen, press "My Score" menu button will go to the current game scorecard, My-Scorecard-Screen.Under Game-List-Screen, click the list item. Click on every list-view item, will transfer to Historical-Map-View-Screen. 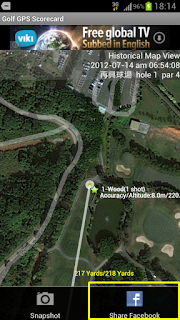 Upon starting the app, Current-Map-View-Screen will be shown. 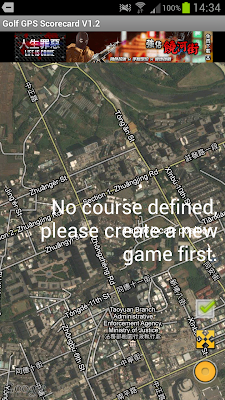 The app then checks if there's any game defined that day, if not, it will show "No course defined, please ...", and notify you to create one before starting a game.Current-Map-View-Screen provides option menu as below: press the "New Game" will create a new game via the New Game dialog.You can create as many games per day but the app will stay only on the one most recently created. Other games created before the most recent become historical games. This means you can no longer edit it (like adding a shot, etc) . 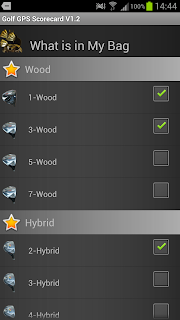 Change LogVersion 1.0, 2012/09/? ?, the initial version. 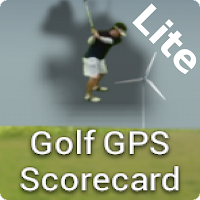 BenefitThis is a very simple and easy golf scorecard provides you the clarify user interface and basic scorecard functionality, like (1) Record the score, (2) Measure distance via Google map and (3) Provide game STATS. That's the reason why it is a lite version. 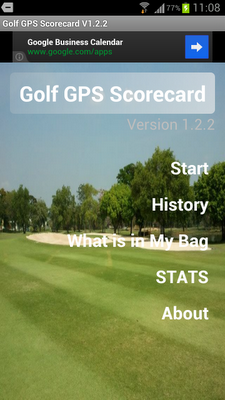 Beside that we also offer another more powerfulGolf GPS Scorecardapp. 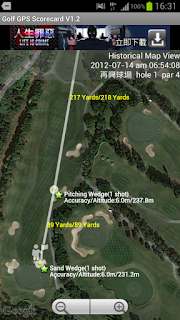 It can record the Geo position, club used and distance of your every shot in the game.